Antonio Villas-Boas/Business InsiderThe Pixel 3, left, and the Pixel 3 XL. 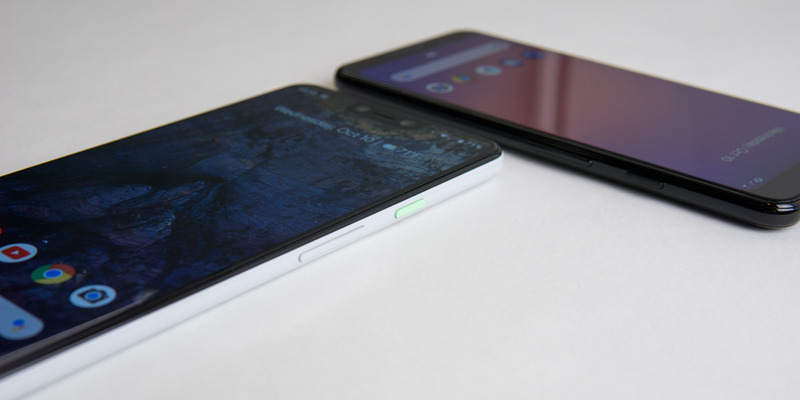 Here they are: the $US800 Google Pixel 3 and $US900 Pixel 3 XL. 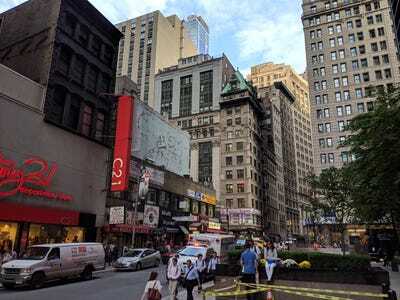 Google announced its latest smartphones during an event in New York City on Tuesday. For those who follow tech news and hardware rumours, there was little about the Pixel 3’s design that you didn’t know about. Google teased us by tweeting before the event that rumour-mongers and leakers didn’t know everything, and it was true – Google unveiled several futuristic new software features (especially related to the camera) that we’re mighty excited to try out over the next few days. Let’s get this out of the way first: yes, the massive rumoured notch is real, and it’s only on the Pixel 3 XL. It’s huge. It’s gaping. It’s shouting at you. In fact, it’s easily the ugliest notch on a smartphone so far. Thankfully, it’s only on the Pixel 3XL. 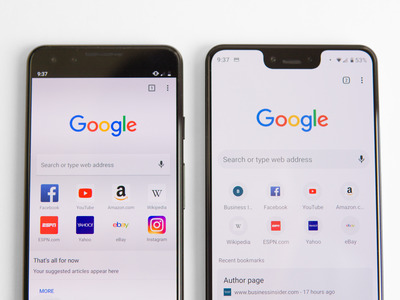 The regular Pixel 3 doesn’t feature a notch, but it still has fairly large bezels on the top and bottom. 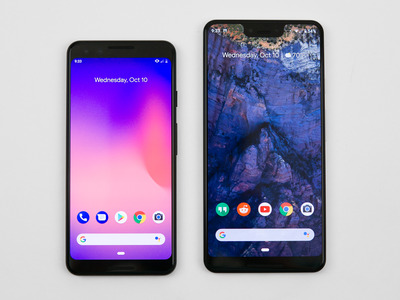 The Pixel 3 has a 5.5-inch OLED display, while the Pixel 3 XL has a 6.3-inch OLED screen. 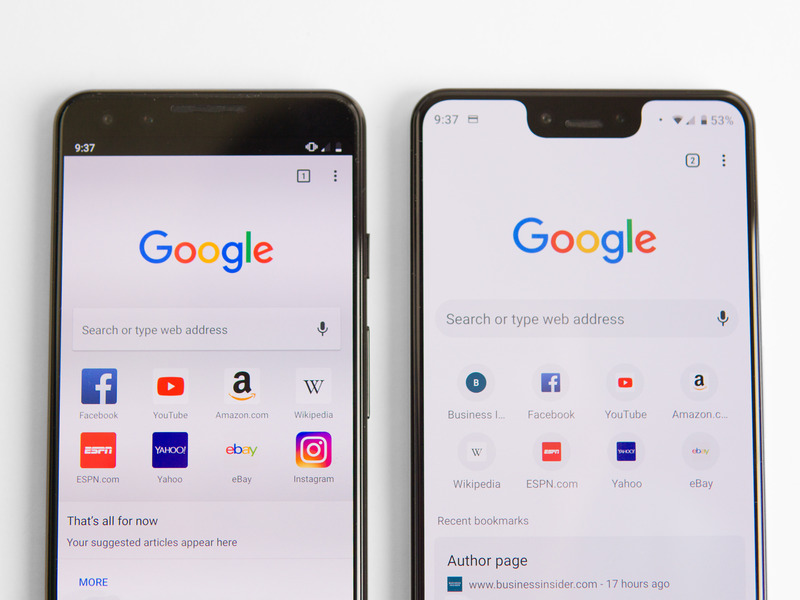 Both phones have bigger screens than their predecessors, the Pixel 2 and Pixel 2 XL. 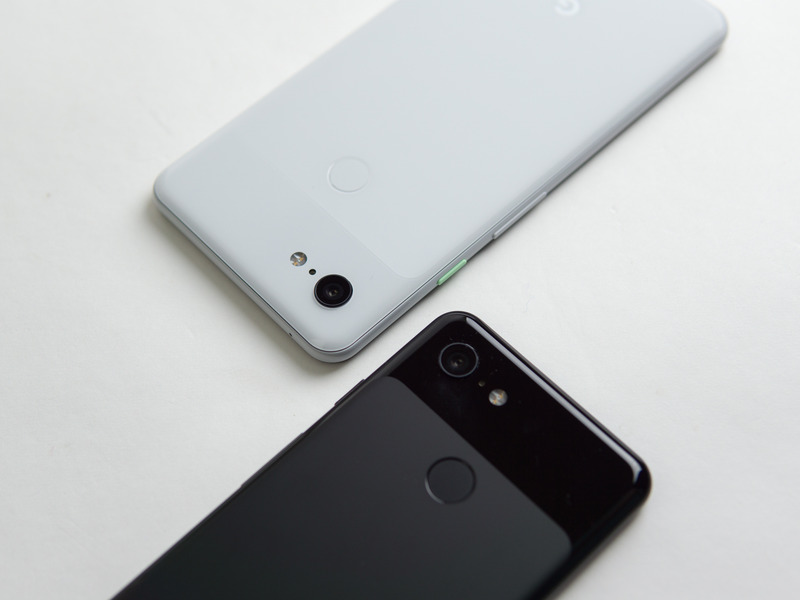 At the same time, neither phone is much bigger than the Pixel 2 phones. Both new Pixel 3 phones have a gorgeous, two-tone glass back. 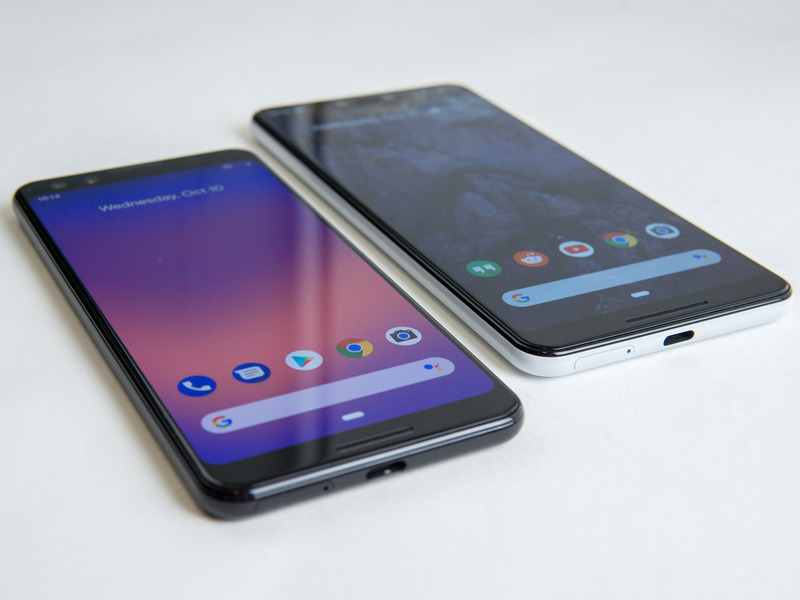 Laying hands on both new Pixel 3 phones, it was immediately clear that they’re decidedly more premium than previous Pixel models. That extra sense of premium manifests itself in the way the phone looks and feels, especially its new glass back. It’s a full glass back with a two-tone texture – the top is glossy, and bottom is a matte, frosted glass. 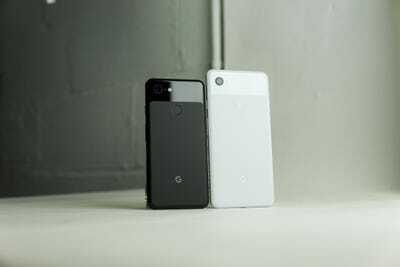 The design change has brought Google’s latest Pixel phones up to par with other premium devices. 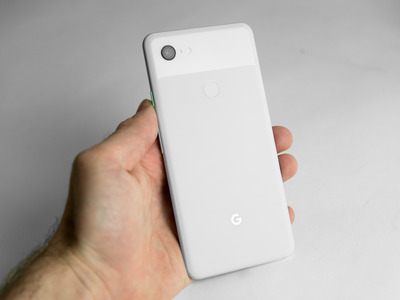 One more thing: the white model of both the Pixel 3 and Pixel 3 XL has a mint green power button, which I’m in love with. Both phones run on the same chip as most premium smartphones of 2018. The Snapdragon 845 chip from mobile chipmaker Qualcomm runs in both Pixel 3 phones. The phones also have 4GB of RAM, which should make for speedy and smooth performance, even if other premium phones have more RAM. That’s because the Pixel 3 phones run on a clean version of Android that’s optimised specifically with the Pixel 3’s specs in mind. Both phones still come with a single-lens rear camera system, but it doesn’t sound like Google needs more than one lens. The new Top Shot feature uses the “Motion” technology on Pixel phones to capture a bunch of photos before and after you snap the shutter button. If the photo you took when you pressed the shutter button has something “wrong” with it, like someone blinking or last-second movement, Top Shot will recommend a photo that looks better. Google also introduced Super Res Zoom, which basically makes the digital zooming on the Pixel phones a lot better. It’s now more similar to optical zooming you’d find on cameras with two lenses. The Night Sight feature will essentially make for better low-light shots without the use of a super-wide camera aperture like you’d find on Samsung’s latest Galaxy phones. This feature is coming later in October. All the features above are based on Google’s machine learning, artificial intelligence, and software rather than hardware. So far, Google has shown that software improvements can be just as good as – if not better than – hardware to make photos look great. Business InsiderThat’s a standard selfie on the left, and a selfie using the wide angle lens on the right. Instead of adding more rear cameras, Google added an extra camera to the front for selfies. The second lens is an ultra-wide-angle lens that’s similar to what we saw in the LG V40. It allows for more people and more of your surroundings in your selfies. Unlike the original Pixel and the Pixel 2, the Pixel 3 has wireless charging. As a companion to that new feature, Google also announced the wireless charging Pixel Stand, which also activates some compatibility with Google Assistant. 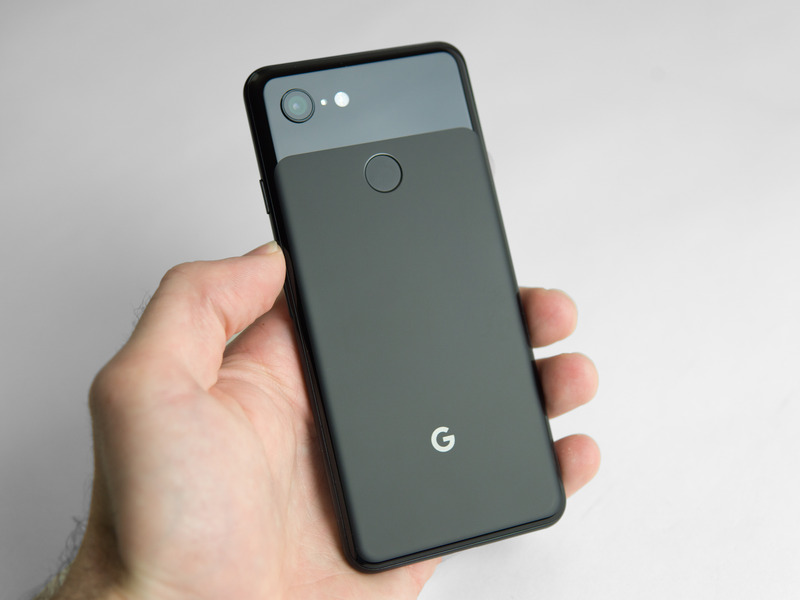 Look out for our full review and rundown of the Pixel 3 phones after we’ve spent some quality time with the devices. We’ll be using the Pixel 3 phones as our daily drivers, and we’ll let you know how these phones compare to other top smartphones on the market.